Trofim Vdovichenko was born into a family of poor peasants in Novospasovka in the Ukraine. He received a primary education. From 1910 he was a member of the Novospasovka group of anarchist-communists, alongside Viktor Belash ,Vassily Kurilenko, Luca Bondarets, Filipp Goncharenko, Vladimir Protsenko and Fomenko who also all had leading roles in the Makhnovist movement later on. In 1914 he was drafted into the army and fought in the First World War. In 1917 he won the full St George Chevalier medal and became an Ensign. With the revolutionary stirrings, he became chairman of the Regimental Committee. In late 1917 he returned to Novospasovka and rejoined the anarchist group. With the arrival of the German invaders, in May 1918 he organised rebel bands which linked up with the Makhnovists in the autumn. He was delegate to the Makhnovist Congress on 3rd-4th January 1919 and was elected commander of the 1st Rebel Regiment, later converted into the Novospasovsky regiment which at various times numbered between 2 and 6 thousand. During winter and spring 1919 the regiment fought against Denikin. According to Arshinov “he was extremely popular and greatly loved among the peasants of the Sea of Azov region, and among the insurgents ". Belash called him a fanatic for the permanent anarchist revolution. At the moment of the break with the alliance between the Bolsheviks and the Makhnovists, he remained at the front, holding off the White offensive. In early July 1919 his regiment was included in the Red detachments under the command of Kochergin and then of Fedko. In August 1919 his detachment refused the Bolshevik order to leave the Ukraine, and linked up once again with the Makhnovists. At the All-Army congress of 1st November 1919 he was elected a member of the Revolutionary Military Council of the Makhnovists, and commander of the 2nd Azov Corps. During the battle of the Uman on 27th September the Vdovichenko detachment completely destroyed the 51st Regiment of Lithuanian officers and captured 2 large White Cossack divisions. They then quickly advanced in the rear of Denikin, and in rapid succession captured Aleksandrovsk, Tokmak, and Berdyansk, where they seized a huge quantity of ammunition, Nogai, Novospasovka and Mariupol. They then launched an offensive on Volnovakha and Taganrog, held by the forces of Denikin. At the end of October 1919 the Whites started an offensive in the direction of Moscow. Vdovichenko’s Makhnovist forces retreated to the right bank of the Dnieper near Nikopol. During this period, under the command of Vdovichenko there were three cavalry brigade and two infantry regiments with 1,000 combatants which rose to 21,00. In November 1919 heavy defensive battles were fought, and in December the Vdovichenko grouping went on the offensive again and took part in the re-capture of Aleksandrovsk on 28th December 1919. In early January 1920 in a Makhnovist controlled district the Red Army launched a provocation by attempting to disarm Makhnovist groups, which started off a general offensive against the movement. Vdovichenko went into hiding near Novospasovka, and had to argue against the pro-Soviet positions of the majority of Novospasovka anarchists- he insisted on the need for immediate organisation of peasant units to defend themselves from the punitive actions of the Soviet authorities. As a result of the Bolshevik repression against the peasants, the Novospasovka anarchist group was forced to return to the side of the Makhnovists on 8th May 1920. In summer-autumn 1920 Vdovichenko wa led a guerrilla movement against the Bolsheviks in the Mariupol and Berdyansk areas. In October 1920, after the conclusion of the last military-political alliance with the Bolsheviks, he went to Gulyai Polye to consult with the Makhnovist command and then went back to Berdyansk/ Mariupol area to organise resistance. He organised the 2nd Azov Corps of the Makhnovists and then linked up with the main Makhnovist body. The Vdovichenko units participated in battles against the Red Army. 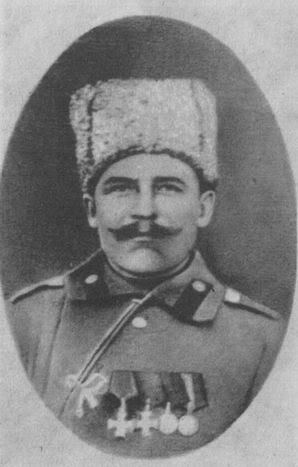 Vdovichenko and Makhno led the negotiations with Mironov, commander of the 2nd Red Cavalry, whose detachment then came over to the Makhnovists. At the end of January 1921 Vdovichenko was seriously wounded in a battle with the Reds, and on 17th February he was taken for treatment to Novospasovka, accompanied by a small detachment. In April 1921 he was discovered and arrested by a Bolshevik punitive detachment. “Vdovichenko and his comrade Matrosenko (well known as a peasant poet N.H.), while defending themselves against the enemy and seeing that they were about to be captured, shot themselves. Matrosenko died instantly, but Vdovichenko's bullet was embedded under his skull above the neck. When the Communists found out who he was, they gave him first aid and saved him from death”. (Arshinov) He was put in the Cheka prison at Alexandrovsk. Several times the Makhnovists unsuccessfully tried to free him. “He was tortured atrociously. They tried to make him renounce the Makhnovshchina and sign a paper to that effect. He scornfully repulsed their offers, although he was so weak that he could hardly talk,” (Arshinov) and threatened with death. In May 1921 he was shot by the Cheka, who then falsely claimed that he was among some Makhnovists who had availed themselves of the chance of giving themselves up. On October 18 2018 a plaque in honour of Trofim Vdovichenko was unveiled in his native village of Novospasovka (now known as Osipenko). In accordance with the need of the ruling regime to co-opt likely heroes, the ceremony involved the incongruous participation by soldiers with a nationalist flag, a Ukrainian Orthodox priest, and a government official. Nevertheless this is a worthwhile event because historical research for the plaque was supplied by respected historians of the Makhnovist movement Vladimir Chop and Igor Liman. And it helps to show that Nestor Makhno was not an isolated figure, but part of a movement involving many thousands of people.